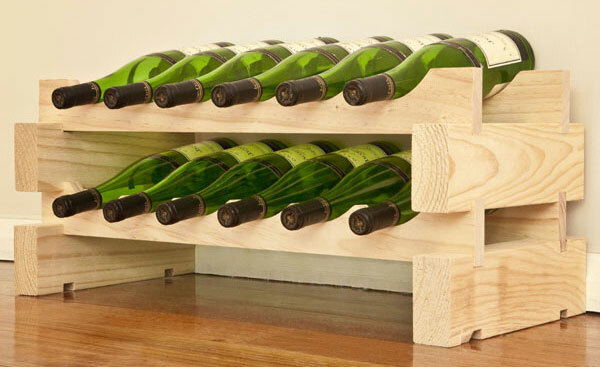 How would you like to win a 12 bottle natural pine Modularack Wine Rack in Wineware’s Competition? Perfect in time for a pre-spring clean, organise your wine collection in style with this wine rack! This easy to assemble and beautiful looking wine rack can hold up to 12 standard bottles of wine, making it perfect for storing some of your favourite bottles. It’s simple to put together, you don’t require any tools as the pieces slot together with ease! This wine rack will add a little something to wherever you choose to place it, whether it sits proudly in your lounge or on the kitchen work top. How to enter the Wineware Competition? If you would like to be in with the chance of winning such a splendid wine rack, then enter our competition below. Simply like us on Facebook, follow us on Twitter, Tweet us, add Wineware to your Google circle or leave a comment on the blog! This Wineware competition ends midnight on 31/03/2014…so entry now to be in with a chance! I’d put this Modularack wooden wine rack in our dining room, near the sideboard. Great prize from a great site! I’d put it in my garage, as it is cool and dark and a great place to store wine. I’d have to take friends in to look at it though, so it would make me keep the garage tidy! In the dining room pride of place! Great competition – if I was lucky enough to win I would keep it in my dining room! Just the right size for our home! fab fab fab!!!! i want it!! please!!! I’d keep it in easy reach…. at the end of the bed! I would give this to my daughter and son in law who have just got married and bought themselves a little flat. In my kitchen very close to the wine glasses! Just what I need to get my wine out of the box!! Lovely Wine rack & rustic.. Would look lovely in My kitchen.. Love it. In the larder because it is a constant temp and dark. I will put it in the kitchen, on top of the unit. looks like a great way of neatly storing your bottles! id put it in my dining room, next to my table….easy access! I would sit the wine rack into fire place in the kitchen and it just might stop the cat from using the fire place as her litter tray!!! Beautiful wood, Would look stunning in the kitchen! AN ELEGANT PRIZE BUT i CAN’T HELP FEELING SORRY FOR THE POOR POSTIE WHO HAS TO CARRY IT DOWN THE GARDEN PATH OF THE LUCKY WINNER ! On the kitchen worktop in our new house. I’m not sure that I can keep 12 bottles of wine long enough! I would put the rack in my kitchen, where the wine would be in easy reach of the fridge and where it would remain cooler. I’d pop it in the kitchen on the worktop! Very stylish, think I have enough bottles to fill it! I have just the space for it! Just don’t know how long it will stay full for! it’s got my name written all over it! Got a space in my dining room for this. I’d keep it in the kitchen and within easy reach of the dinner table! Nice prize just need 12 bottles of wine now!! What a great wine rack. If I won this I would have the rack, but not the wine…I love shopping though! Lovely prize have the ideal home for it! I would love to win this- however whether I have the will power to ever reach 12 unopened bottles being in the wine rack is yet to be tested !! Just big enough to store those ‘liquid requirements’ !! !